Mardi Gras occurs nowhere near Christmas, of course. 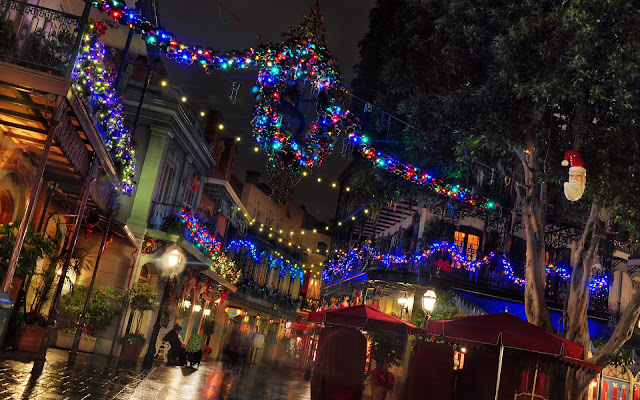 But over in the French Quarter-inspired New Orleans Square, the holiday decorations certainly convey that effect. Luminous Christmas lights, colorful beads, and fantastic ornaments all combine for a dazzling and festive effect. New Orleans Square is a dashing and exciting land, so it makes sense that its yuletide decorations are jazzed up and ritzy. The locals would probably have it no other way! Some dazzling nighttime decorations at New Orleans Square.